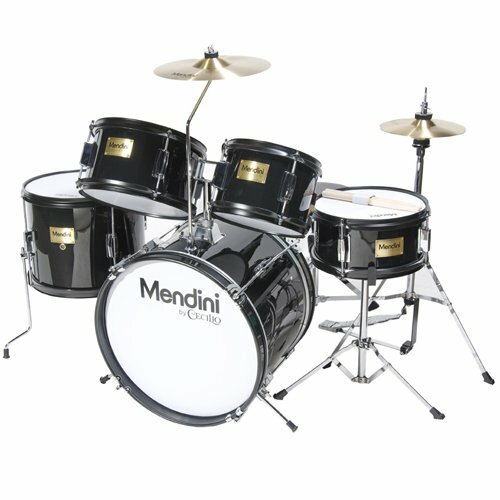 If you are looking to buy a decent Junior drum set then you should consider Mendini 5 piece. It is the perfect choice for aspiring and novice drummers since they will get a drum set, which is simple to play, reliable and durable at the same time. If you would really like your kids to learn drums, then getting them one of these will really give them a head start. It would be a significant improvement compared to buying them things like drum pads or roll-up drum sets. Even though it comes from cheaper laminated poplar shell, you will still get deep dynamics, warmth, and resonance. Stay with us so that you can learn more about Mendini 5 drum set that you should find for your particular needs. You should check out this video to see it. It’s actually good to see an adult sitting behind this kit because it gives a bit of perspective on the size of it in comparison to full size drum sets. How tall do my kids need to be to play this? Official guidance for this drum set is that it’s suitable for kids between 2.5 feet to 5 feet (The man in the video above falls outside of this!). In general, it’s good to get your kid a drum set that’s suitable for their height. Otherwise, it can cause ergonomic problems and they may have difficulty reaching for the pedals, cymbals, and drums. Nearly as loud as you should expect acoustic drums to be! The drums might be smaller, but they are still a decent size. 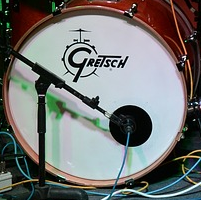 For example, the bass drum is 16 inches in diameter. This is smaller than a full sized bass drum but it still packs a punch. If you want something quieter then check out our article on the best electronic drums sets for kids. While you’re at it, you should make sure to protected your child’s hearing, it’s absolutely vital. 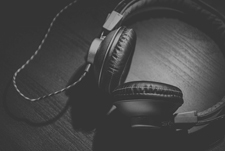 For adults, we always recommend either some musician’s earplugs or drum headphones. There are similar options available for kids. When it comes to Mendini 5 drum set, you will get a junior drum set that will provide you everything a kid needs to start improving drumming skills as time goes by. Everything comes from poplar basswood shells in combination with PVC cover for added durability. You should have in mind that the quality of construction is very good. You can choose to save color finishes that include metallic bright red, metallic wine red, gloss white, metallic silver, metallic green, metallic blue, and metallic black. The first and main reason why people choose Mendini 5 drum set is due to the affordable price tag. Since you can find many drums on the market that come with a significant price, when finding the first instrument, you should choose the quality instead of price. According to most previous users, the design and construction are impeccable, and you will still be able to afford it when compared with other drum sets on the market. You can find it in wide array of colors, which is another reason for its popularity. Since the Mendini is a trusted brand on the market, they are known for making affordable drums with quality, so that you can transit from beginner to mid-level skills with ease. Afterward, you can find a better choice than this, but for the beginning, it is a perfect solution. Apart from the idea that you will be able to find it for a cheap price tag, it is essential to understand that you will not get a lousy set that will decrease your motivation for playing and practicing. The drum set is very easy to set up, but you also get a user manual that you can read so that you can learn how to install it with ease. It would probably only take about 20 minutes to set up. 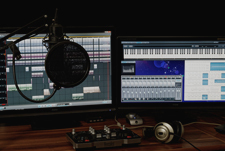 You can also find numerous tutorials online that will help you along the way, but the user manual is well written, so you do not have to research and lose time, but analyze it and start playing. Apart from wooden drumsticks, you will get an adjustable throne, which means that kids of different heights can play it with ease. As you can see from everything, we have mentioned above, the Mendini 5 drum set is the perfect solution for young drummers. At the same time, a combination of bells and whistles as well as durable construction means that you will be able to use it for years after purchase. Value For Money – 10/10 – The best thing about Mendini 5 drum set is that you will be able to find it for the cheap price tag and get good drums that will sound decent. Features – 9/10 – When you have in mind that you will be able to get it for a decent price tag, you will get a wide array of features that will help you along the way. 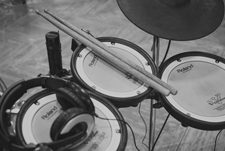 Of course, we are talking about acoustic drum set, which means that you will not get the same bells and whistles as on electronic drums and controllers. 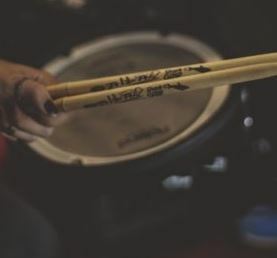 However, it comes with a user manual that will allow you to install it with ease and you will get all accessories that you need to start drumming right away. Playability – 9/10 – It’s very playable for junior drummers and is set up nicely and ergonomically for them. You will get all the accessories you need to play as soon as you get it, which means that this particular brand has thought about young players and their ability to stay motivated during the practice. Sound Quality – 7/10 – This is a junior drum set so we’re not expecting a top level acoustic kit here! But all-in-all, the sound quality is very decent for what it is. So that was a quick overview of the Mendini by Cecilio 5 Piece Junior drum set. Very good quality, easy to set up, and will get your kids ready to play on a full sized drum set in later years.